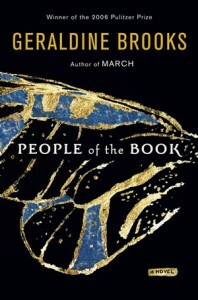 People of the Book by Geraldine Brooks (who won a Pulitzer for her 2006 work March) is a work of fiction based on the Sarajevo Hagadah. This is the only significant novel about hagadot I was able to find. One of the earliest illuminated Jewish manuscripts, the priceless antique haggadah serves as the vehicle for a 500-year worldwide journey tracing its ownership in an exciting adventure that takes Hanna Heath, an Australian rare book expert, to Europe in 1996. For more details, click on the author’s name above. Click here for the NY Times review in 2008.